Our plan was to walk along the shores of Harrison Lake. A sign offering a cruise caught our attention. We took advantage of the moment and stepped aboard the Laroan for a 2 hour cruise around Echo Island. Harrison Lake is at the end of the Fraser Valley, a couple of hours inland from the city of Vancouver. On hot days, the air from the city funnels up the Valley and is trapped by the mountains, creating a hazy smog, clearly visible in these photos. The colour of Harrison Lake is a beautiful green at present, made so by the glacier water which feeds the lake. The colour is created by minerals ground to dust and deposited by the glacier. Later in the fall, when the glacier freezes and ceases feeding the lake, the colour will revert to blue. The photo above was taken from the boat, looking towards Mt. Cheam and the town of Harrison. Judy, of Judy's Front Porch shows a different side of the mountain on her blog. Such a lovely weekend. Relaxed visiting, dinner with my siblings and their spouses at my parents, and a trip to Harrison Lake this afternoon. Tomorrow, we're up at 5 am and heading east - an 11 hour trip in the car. Good thing Tim and I enjoy each others' company! Mary's Mosaic Monday linky is not yet up, but I'll post this for now and link up later, if possible. What stunning scenery. Looks like a wonderful 2 hours! I don't envy you your drive today though - I remember doing 7 or 8 hours driving to our home in France and saying never again. It reminds me a little of a trip we did through the Inside Passage from Vancouver island upwards. Wonderful scenery. Oh how fun to see the other side of the mountain. I always wondered where the turquoise color came from. Thank you for that explanation. I guess something came up with Mary. I've already moved on because it felt awkward to assume, as I always do, that Mosaic Monday will be up and at'em. Oh well, Mary has us well trained. A beautiful mosaic it is! I was going to ask if you had edited the photos. Simply wonderful scenery! 35 years ago we honeymooned there! Oh, such beautiful blues and greens! Armchair travelling, almost as good as the real thing, thanks for taking me along on the cruise with you all. I sure can get a sense of being there through your photos! have a good trip! What a wonderful trip! These mountains are fabulous! You were close by! I'm glad you had a great trip! Such a beautiful spot...and so close to 'my front porch'! 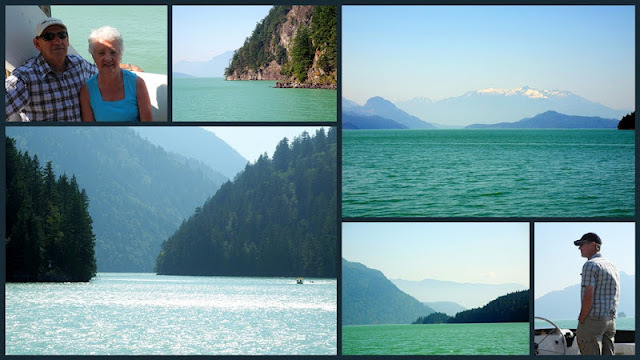 We have also done the Harrison Lake cruise on the spur of the moment...a spontaneous adventure with our friends from Switzerland. Glad you enjoyed your weekend in the valley...and hope your week has gone well.